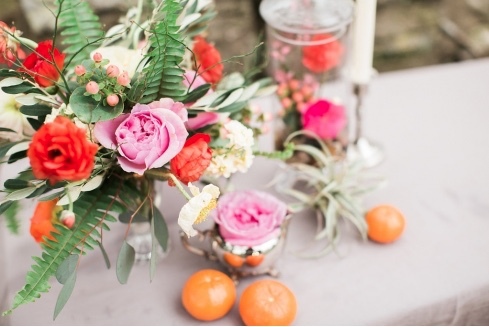 Today we are so happy to spotlight an amazing Nashville florist, Kate owner of Owsley Design. How did you get into floral and event design? I have always been driven by the need to create. In college, I studied fine art. I experimented in several media, from wood to paint to metal; sculpture was always my favorite. I have always enjoyed decorating and event styling, and had the opportunity to help make the arrangements at wedding for several friends. I fell in love! Afterwards, I became the manager of a floral design studio in Boston where my event clients ranged from brides with garden weddings to corporate event for the Boston Celtics and NHL All Stars. I have been featured in Style Me Pretty, All You Magazine, 5th & Hollyhock, Parade magazine's Community Table, and Huffington Post. When I moved to Nashville, I decided it was time to open my own floral design studio, Owsley Design. Because of my experience in sculpture, I look at each flower arrangement as its own work of art, creating unique compositions with a balance of color, texture, and movement. Explain your process of working with a bride. My favorite part of a wedding is getting to know the bride and groom. When we first meet, I make sure to learn their story and personalities as well as their wedding style and dreams. It is one of the most important days of their lives, and I am honored to be a part of it. The better I get to know the couple, the more unique and personalized the wedding decor and floral designs will be. Each bride and groom is completely different and special from the next, why should their flowers look like everyone else's? After we have talked about their favorite inspiration photos and ideas, I create a custom flower board to show them all of the options and designs that will fill their wedding. We continue to customize until every detail is perfect. The day of the wedding, I personally ensure that each arrangement is better than they had dreamed of. We only take one wedding per day, so all of our attention is focused on the bride. At the end of the day, when I see the smiles on the bride and groom's faces, I am reminded why I love working with flowers & weddings. It changes every week! Each season offers its own unique opportunities, and each design opens doors for new colors, shapes, and textures. We always love trying out new ideas, and select flowers that are appropriate to the client and design, not my personal taste. That being said, I tend to be drawn to lush blooms (peony, ranunculus, dahlia) and unique details (berries, pods, or grasses). We only buy the highest quality flowers, and never deliver less than our best work. What makes you different from other florist? Besides being an artist, I am also passionate about well designed environments and interiors. Not only do I ensure that each detail of the flowers are perfect, but I also believe the whole room should flow seamlessly together, creating an inspiring design that guests will remember for years to come. What’s one thing you love to hear in consultation with a bride? Their engagement story! We focus on designing florals that are custom to the bride and groom. What better way to get to know them than to hear about the moment they decided to spend the rest of their lives together? It is fun when a bride allows us to take hold of the creative reigns and make her something beautiful. We have lots of ideas and would love to make something new for your wedding day! I also empathize with a bride who knows exactly what she wants. At the end of the day, we are there to make the design process easier and make your wedding day beautifully and uniquely you.